England 361 (Ian Bell 109, Jonny Bairstow 67, Jonathan Trott 58, Ryan Harris 5-72) and 3-31 (Peter Siddle 3-4) leads Australia 128 (Shane Watson 30, Michael Clarke 28, Graeme Swann 5-44) by 264 runs. The home side piled up 361 runs in their first innings followed by 31 for the loss of three wickets in the second whereas the visitors were bowled out for 128 mere runs in their first. The eventful second day’s play of the 2nd Test came to an end on Friday, July 19, 2013, at Lord’s, London. The bowlers from both sides dominated the game by grabbing 16 wickets during the day. Earlier, England started off at 7-289 after 89 overs whereas Tim Bresnan and James Anderson were at the crease at 7 and 4 runs respectively. Bresnan was gone on the very first ball and was replaced by Stuart Broad in the park. The batsmen hit 4 fours in the coming overs as Anderson was caught behind by Brad Haddin off Ryan Harris for 12. 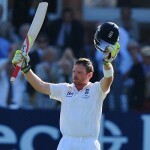 The 9th wicket fell at 313 when Graeme Swann and Broad added valuable runs with regular boundaries. Swann hit 3 fours in the 98th over and Broad accumulated 11 runs in the next over with 1 six and 1 four. Stuart Broad became the last victim after scoring 33, Swann held his end for 28 while the hosts powered 316 runs in the first innings. Ryan Harris was the supreme bowler with five wickets, Steven Smith held three whereas James Pattinson and Shane Watson shared one wicket each. Watson and Chris Rogers opened the innings for the Kangaroos carefully by scoring 14 runs in eight overs. The first added 21 runs in the following two overs with four boundaries and the score was taken to 42 in 12.4 overs. Shane Watson was declared leg before wicket off Tim Bresnan for 30 from 42 balls with 6 fours when Usman Khawaja walked in the center. Rogers followed his partner eight runs later for 15 and Phillip Hughes was smartly stumped by Matt Prior off Bresnan for just one run. The Australian skipper took guards next under tremendous pressure as Khawaja was caught by Kevin Pietersen off Graeme Swann for 14. Clarke was stranded at the one end whereas the wickets kept on crumbling at the other side at regular intervals. He was the sixth batsman who went back to the pavilion for 28 off 41 with 4 fours. James Pattinson and Ryan Harris were the only other batsmen who entered the double figures by scoring 10 runs each as the innings of the entire Australian side was folded back for 128 in 53.3 overs. Graeme Swann was the star performer with five wickets, Tim Bresnan got two whereas James Anderson and Stuart Broad chipped in with one wicket each. England secured a commanding first innings lead of 233 runs and their second one was initiated by their captain, Alastair Cook, along with Joe Root. They crept to 22 after 10 overs when Peter Siddle clean bowled Cook for 8 runs on the second ball of the next one. Siddle removed Trott for a duck and got another important wicket of Kevin Pietersen when he had scored just five runs. 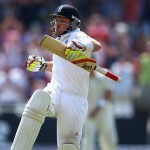 Joe Root was unbeaten at 18 and Bresnan had yet to take a run when the hosts reached 3-31 in 20 overs. Though England has lost three quick wickets in their second innings yet they have an upper hand in the game with a formidable lead of 264 runs with seven wickets still in hand. The Australian bowlers have to work hard on the third day and their batsmen have to bat miraculously to save the encounter.